On Thursday, Kudumbashree, a women's self help group in Kerala, donated Rs 7 crore to the Chief Minister's Distress Relief Fund (CMDRF) to help flood victims in the state. The contribution equals the amount donated by tech giants Google and Apple, and is Rs 3 crore more than that given by Bill and Melinda Gates Foundation. However, the benevolence of Kudumbashree workers multiplies further as the amount was contributed from their meager incomes. In addition, a good number of Kudumbashree workers were themselves victims of the recent deluge. But that did not deter them from donating selflessly. Following a request from its Executive Director S. Harikishore, Kudumbasree neighbourhood units named 'Ayalkoottams' donated at least a week's income to help the victims. In addition to this, the amounts set aside for Onam celebrations and other contributions in personal capacities helped them raise the huge amount. Kudumbashree, a poverty eradication programme run by the Kerala government, finds income from various micro-enterprises such as retail outlets and eateries that it has set up across the state. They also undertake sanitation services in some areas. 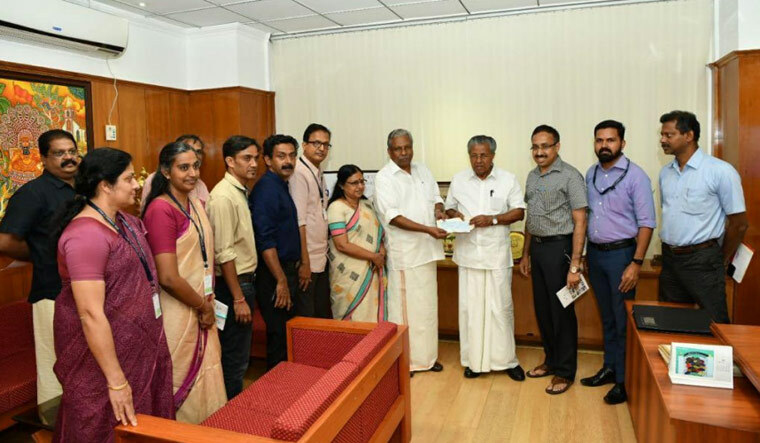 The fund was handed over to Kerala Chief Minister Pinarayi Vijayan on Thursday. Apart from the donation, Kudumbashree members were also involved in cleaning more than a lakh houses and 2,000 public spaces, and provided counselling to around 8,000 people affected by rains and floods. Kerala has received Rs 730 crore in contributions to CMDRF till date, CM Pinarayi Vijayan said on Thursday. More than four lakh people have so far contributed to CMDRF since August 14. Interestingly, the humanitarian aid received by the state has surpassed all other relief funds.